Tom Hanks is back out on the water again with Paul Greengrass‘ ‘Captain Phillips‘, ste true story that was covered in the media a few years ago, where cargo ship captain Richard Phillips (Hanks) and his crew were attacked by Somali pirates off the coast of Africa during a delivery, and where Phillips was actually taken hostage in a tony life boat for a few days. As there have been several survival movies coming out as of recently, this one in particular can sit high with the rest of them, as Greengrass and Hanks do exceptional work and keep this two-hour long suspenseful film on the edge of your seat. I expect high box office returns for this outing as Hanks and the plot will drive people to theaters this weekend. 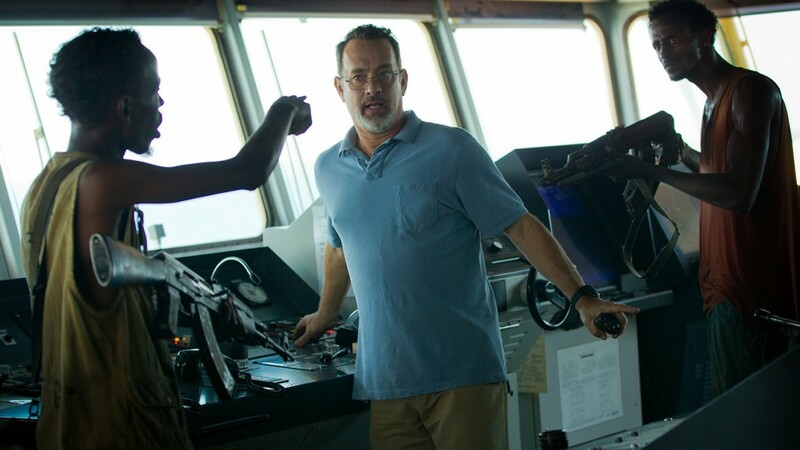 I was a little worried that ‘Captain Phillips‘ would be an eye sore as Greengrass is known for his quick and jerky cuts from his ‘Bourne’ movies, but I can happily say, that those obnoxious angles and edits have been left out. The film opens up with the good captain saying goodbye to his family as he is about to embark on a little trip to haul tons of food, medicine, water, and other goods to Africa. However, his big cargo ship and crew of about 20 workers have to go through some unprotected waters to reach their destinations. Phillips is a no non-sense guy and is always on top of his staff in doing their jobs. He knows the score and has been around the block a few times. He knows that he is going into these dangerous waters and even sets ups drills in case his ship is attacked by Somali pirates, who we have come to know in the news as desperate poor civilians in an anarchist country whose only means of making money is to kidnap and hold ransom foreign boats and captains for large sums of money, so that thy can pay off their evil bosses and possibly eat the next day. As Phillips and his crew are just out to sea, a large group of Somalis are standing beachfront and being recruited and heavily armed to take two small boats and attack the incoming large ships in hopes of a big financial score. These somalis must only weigh 115 pounds at the most and can’t be over the age of 25. It seems that one of the groups that is recruited is led by a guy named Muse (Bakhad Abdi), who doesn’t want to hurt anyone, but just survive. As Captain Phillips is running a drill for an attack, he notices two small boats racing toward his large boat and a real attack is underway. Phillips does everything he can to prevent these pirates from boarding their ship, but due to the ship’s largeness, it can’t turn or move fast, and the pirates soon dodge the large firehoses and are aboard a ship of over 20 crew who have no weapons. Phillips instructs his crew to hide in the engine room and keep out of sight as Muse calls Phillips ‘Irish’ from now on and demands money. After a bit of stalling and taking the pirates around the ship, Phillips gives in and gives Muse the $30k that is on the ship in cash. However some of the other pirates who have a super hot temper believe that if they kidnap Phillips, they will get an even bigger payday. As the navy and military have been alerted and are on their way, the pirates and crew have a standoff, but the pirates have the upperhand here and take Phillips away in a dingy lifeboat, which they hope to make it to Somalia in under two days. Soon, the military, helicopters, Navy Seals, and several warships are tailing the little enclosed lifeboat, as tensions keep building on both sides. Muse often reminds Phillips that he is just a simple fisherman looking to survive and is not out to hurt anyone, but the same cannot be said for the other three pirates in the lifeboat who are constantly beating Phillips. In the big climax of the film, we again come to realize why Tom Hanks is one of the best actors in the business. We all know how it turned out in real life, Phillips was rescued, but what Hanks gave as a performance, is nothing short of perfection in the final ten minutes. His shock and terror of what had happened to him is simply stunning. He is speechless, silent, and only mumbling incoherent questions as the nurse asks him who he is and does he know where he’s at. You have to see these final minutes of this film, for they will truly stay with you for a while, and the hour and a half before it only builds that tension and release. Greengrass did a great job with this film as his camera took us to a claustrophobic setting where we the audience are trying to breathe and stay calm as our hero Phillips is. And the pirates all do a decent job, if not a cliched job here and there, but it gets the job done. Note that the pirate in charge of driving the small life boat is constantly terrified. Henry Jackman’s musical score amps up the suspense and keeps things moving. 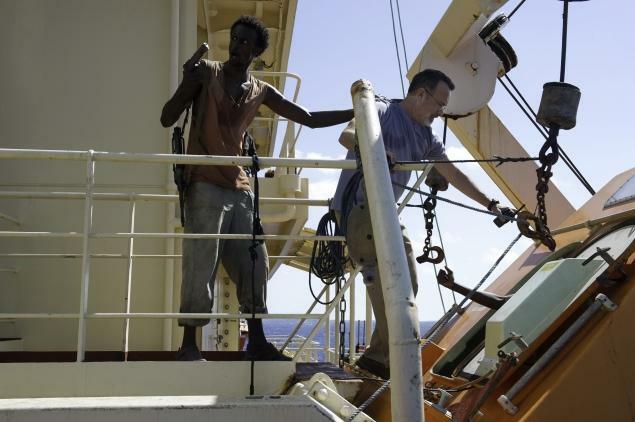 ‘Captain Phillips‘ is one hell of a fine film and reminds us why we all love Tom Hanks. Great picture. This entry was posted on Thursday, October 10th, 2013 at 11:44 am	and is filed under Film, News. You can follow any responses to this entry through the RSS 2.0 feed. You can skip to the end and leave a response. Pinging is currently not allowed. « ‘The Multi-Media Men Podcast #10 – ‘October Films That Fascinate Us’!! !